Were completed in 2010, the work of maintenance plexus. The complex is equipped with a gym, with large and small tools and garden used for outdoor games free and/or organized and approaches to gardening for small groups of pupils in the classes concerned. The project involves the conversion of the existing building in Vigolo intended to nursery colony and now discontinued for the construction of a Home for the Elderly . Well as set up the project, albeit with an in-depth examination of the structure both in terms of size distribution that constitutes a first approach to the problem especially with regard to aspects related to the feasibility both in terms of size and economic - financial. 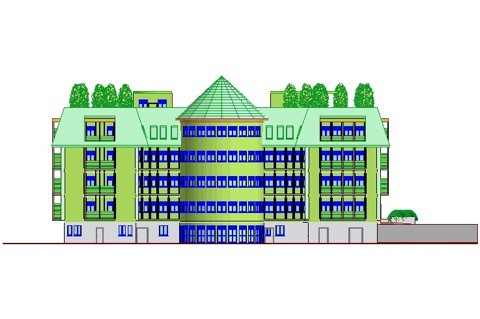 Consists of 4 floors of equal surface and a semi basement area smaller than the upper floors. The floors are connected with each other in the vertical direction by two stairwells equipped with elevators. For the dimensional data and planing design are provided in the table below together with the rough estimate of the costs. The building in general shows good state of preservation under the static profile and in good condition as regards the remaining wall structures. Are totally exceeded both from a technical and normative technological systems. With regard to the location of the building is well connected to the urban context constituted by the City of Vigolo, and is therefore guaranteed a correct "urban accessibility". 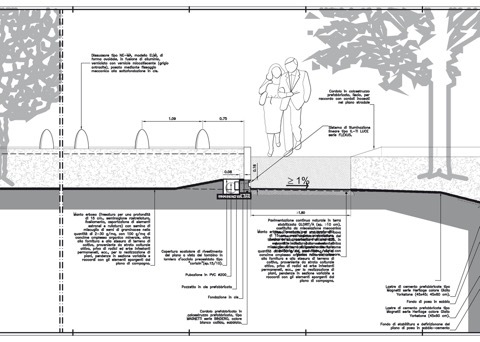 For sizing purposes of the project the fundamental fact is the need to reach about 120 beds in two and one bed rooms. 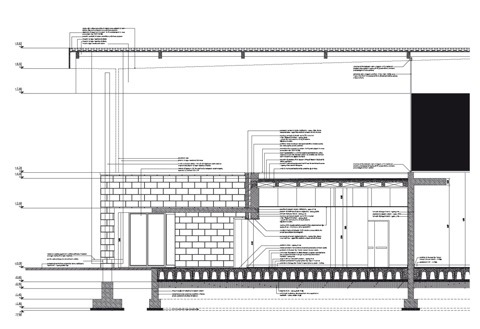 The project essentially confirms the original architectural layout and the main structure of the building. Is confirmed the main staircase, while the need for and distribution of organicity of the structure is integrated into the secondary stairwell, with a new compartment lifts, external to the perimeter of the building. Both stairwells are equipped with lift / stretcher. 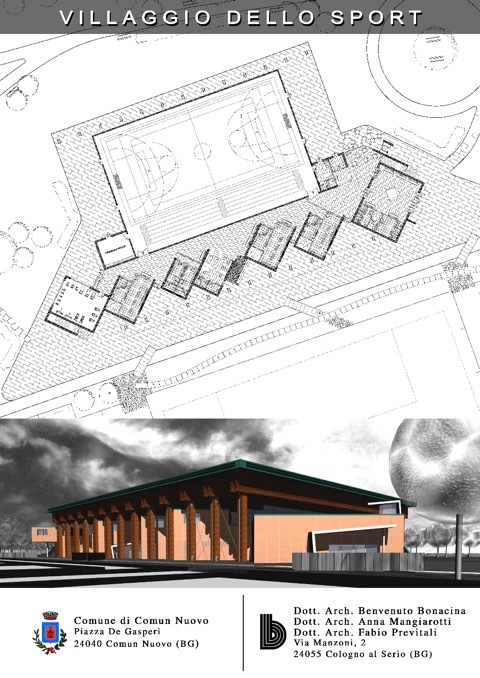 The project involves the change of the shape of the cover in order to mitigate the impact of volume and thus ensure a better integration of the same in the environmental context in which it appears naturally reducing the impact. A similar procedure will be adopted with regard to the prospects. On the ground floor the entrance hall is provided with the main distribution platform directly connected to the stairwell confirmed. Near the stairwell and the main platform for e-mail distribution input are located on the switchboard, the spaces for the reception, lobby, corridors and lobbies. In respect to the North side of the entrance area switchboard is placed on administrative block with toilets in relevance reserved for staff. The dining room, living spaces and related services pertaining to are located in the central part of the building and center of gravity (the dining room is directly connected by lifts/mounts dishes, the kitchen placed in the basement). 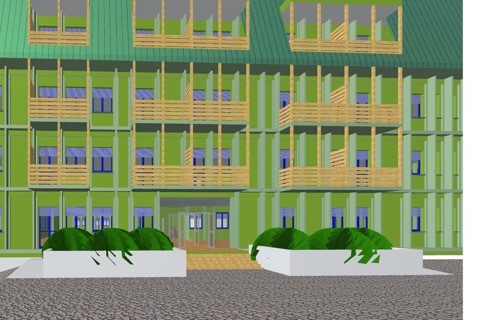 The stay portion of the ground floor is occupied by the bedrooms as well as from the compartment lifts and a new body to stay secondary education. The corridors of distribution are easily legible and regular in shape, have a minimum width of m. 2.00 to connect transverse the entire building, resulting in plots of distributions in front of the stairwell . The corridors with regard to the main traits have direct lighting and ventilation to the outside. The upper floors (first, second and third) are identical to each other and plan distribution are totally occupied by the bedrooms, the blocks of the toilets Community, a space for the exclusive use for the nursing staff equipped with private bathroom, surgery medical service with private bathroom, closets and floor living room with kitchenette . All rooms whether a king or twin beds are equipped with private toilet with adjoining dressing room distribution. All rooms are larger than expected by the minimum norm. There are 10 rooms with one bed and 52 two-bed rooms. In the basement, where it is guaranteed overlooking and direct lighting are located general services and a part of public spaces and in particular the rehabilitation gymnasium with attached two clinics, toilets and changing rooms of relevance, a room for group activities and recreation and are also made ​​of the kitchen, its space pertaining to consist of "cold storage". Complete the services placed in the basement , two large rooms used as laundry and ironing. In the most ever in the East of the basement, with separate entrance and private are located, a space for worship, its sacristy and the mortuary. 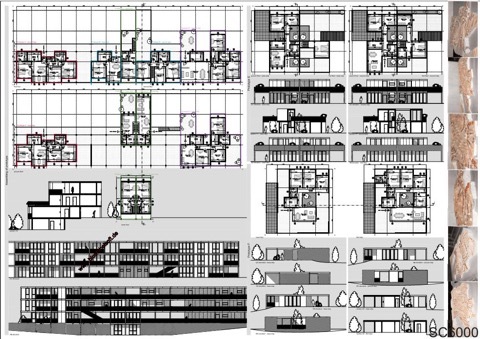 The surfaces and the size of the individual parts of the building are shown on the tables of the project, as well as the table of dimensional data. 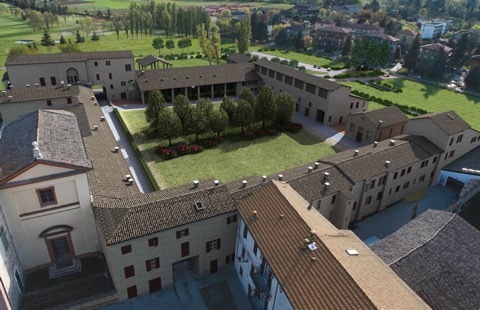 The complex of the Bergamo Hospital, located in the west of the city, at the foot of the Upper Town, in front of Porta San Giacomo, is composed of over 60 operational units organized through a system of types intermediate between the pavilions and the monolithic. 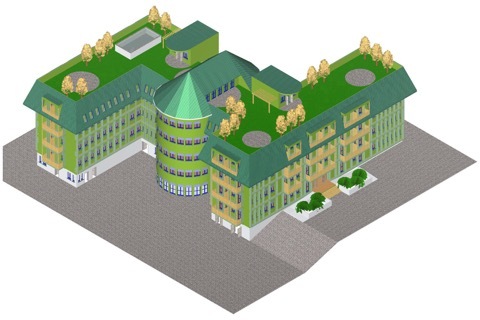 The hospital is located for some time in a general condition of saturation, which led the administration to approve a redevelopment plan and building functional and hold a competition in 2007 that lead to the construction in the locality Trucca, a new hospital of national importance and high degree of specialization, which will accommodate 1,600 beds. 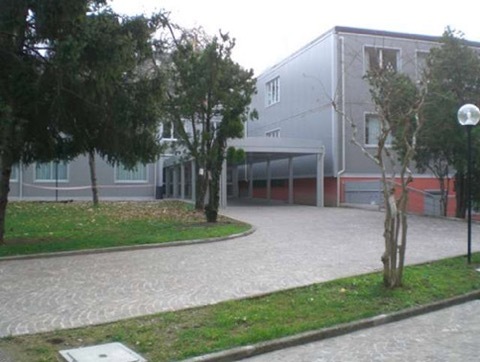 The task assigned to the project team, consisting of architects Benvenuto Bonacina, Mangiarotti Anna and Guido Nardi, fits within this program of measures in order to decongest the operating unit of Cardiac Surgery, since it is heavily loaded on logistics plan both at the operational level, as well as the need to maintain the high standard of the Cardiovascular Department, known and relevant to the national level. The design process that led to the assignment of the assignment took place through the procedures provided for by the laws and decrees in public procurement, in particular by the Merloni law ( Law of 11 February 1994 n . 109, " Framework law works public " ) and its implementing regulation (Presidential Decree 21 December 1999 n . 554, " Implementation of the Law of 11 February 1994 n . 109 framework law on public works, and subsequent amendments " ), through the preparation of preliminary draft by the Technical Office of the Hospital, which agreed on the morphology and planning standards with the municipal bodies and the Superintendence for the Historical, artistic and demoetnoantropologico, assigning the group to design the definition of architectural design graphic and descriptive and deliverables such as technical, economic and administrative center for the issuance of building permits and building of the project. 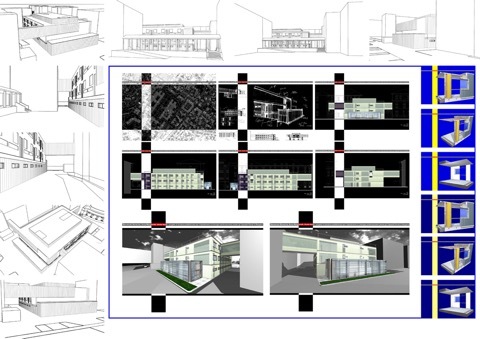 The pavilion defined by the demands of clients consists of three connected to the existing buildings in the vicinity of the second floor, establishing a direct relationship with the departments of nephrology, to the west, and surgery, to the south and east, will also contribute to a walkway by-pass the intensive care unit that will lead to the surgical unit. It is a park in the romantic style “English”, all fenced, which contains a rich collection tree and shrubs, plenty of recreational space and entertainment for children and adults. 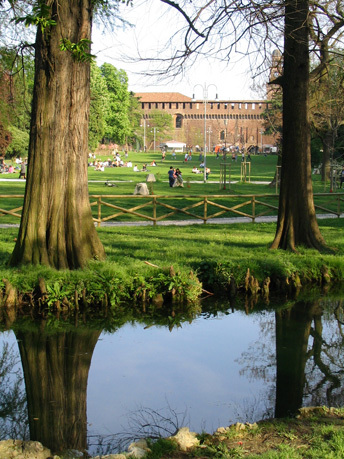 Along its margins are important historical buildings and institutions in Milan, as the Sforza Castle and its museums, the Arena “Gianni Brera”, the Arcodella Pace, the Triennale of Milan,and the Civic Aquarium.